Transfer movies, music and photos from Mac to iPad without iTunes, easier and faster than iTunes! The biggest problem of iTunes is the inability of backing up iPad media files, now we have a better choice for Mac users to manage, back up, transfer and share iPad files - mediAvatar iPad to Mac Transfer as your iPad's iTunes alternative. To avoid the missing of your favorite apps, movies, music, ebooks and photos, mediAvatar iPad to Mac transfer helps you backup all these iPad files to your Mac, or to your iTunes. And you can also use this iPad transfer Mac to transfer apps, movies, music and photos from Mac to iPad without iTunes. 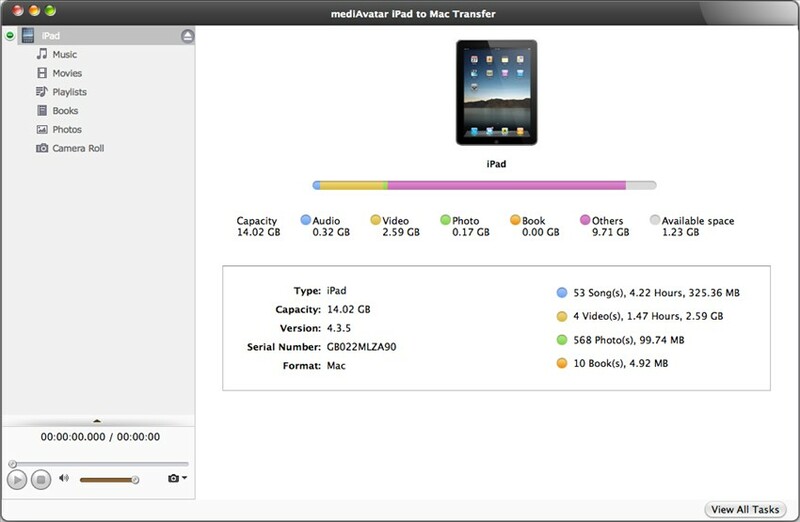 Sharing your iPad movies/music/photos would not be a problem anymore as well with mediAvatar iPad to Mac Transfer, which allows you to connect as many iPads, iPhones, and iPods as you want then transfer movies/music/ebooks/photos in between. 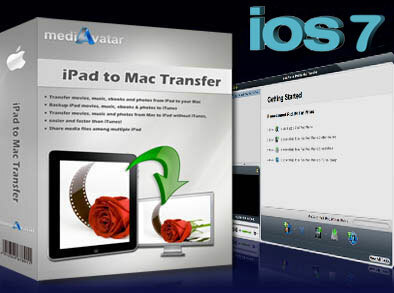 mediAvatar iPad to Mac Transfer is applicable not only to all iPad models (incl. iPad Wi-Fi, iPad Wi-Fi+3G, iPad 16GB, iPad 32GB, iPad 64GB, iPad 2, New iPad, iPad Air, iPad mini), but also to all iPhone/iPod models as iPod to Mac and iPhone to Mac transfer. Download mediAvatar iPad to Mac Transfer for FREE now! Share, backup, manage and transfer iPad movies, music, ebooks and photos on Mac! Still worrying unexpected crash of your iPad or iTunes and missing of your iPad media files? mediAvatar iPad to Mac Transfer will totally dispel your misgivings by backing iPad movies, songs, ebooks and photos to your Mac. Faster and easier than iTunes, mediAvatar iPad to Mac Transfer helps you copy your movies, music, ebooks and photos on your Mac to iPad. Transfer apps between Mac and iPad freely, you can also manage documents for some apps which support this operation. Not only backing up iPad to Mac hard drive, this Mac iPad transfer has another backup channel for your iPad - transfer iPad files to iTunes. MediAvatar iPad to Mac Transfer also works for iPhone and iPod. You can connect multiple iOS devices and transfer media files between them. iPad Wi-Fi, iPad Wi-Fi+3G, iPad 16GB, iPad 32GB, iPad 64GB, iPad 2, New iPad, iPad Air, iPad mini and even iPhone, iPhone 3G, iPhone 3GS, iPhone 4,CDMA iPhone 4, iPhone 5, iPhone 5s, iPhone 5c, iPod touch, iPod touch 5, iPad classic, iPod shuffle, iPod nano, iPod nano 7, iPod mini, iPod 1gen. Supports connecting multiple iOS devices simultaneously. mediAvatar iPad to Mac transfer involves Quick Search and Filter functions, then you can easily and quickly find the iPad media files you want. This Mac iPad transfer allows you copy, edit, delete and create your iPad playlist, and even transfer playlists among iPads, iPhones and iPods. As this mediAvatar iPad to Mac transfer can also be your iPhone to Mac transfer, enabling you to manage and share iPhone ringtones among many iPhones. You'll enjoy the album art in your music collection even more. Grid View lets you browse all your music, movie, picture by their cover art. Or Search your collection by Album List View, Artist list view, Genres list view or Composers list view. Identifies your iPad information automatically when it is connected, including model, capacity (used and available space), version, serial number and format for your checking. mediAvatar iPad to Mac Transfer deals with all iPad to mac transfer and Mac to iPad transfer at extremely high speed. mediAvatar iPad to Mac Transfer's interface is available in English, German, French, Italian, Spanish, Japanese, Simplified and Traditional Chinese languages.